Plus, the designer shares her best tips on how to style the statement-making pieces. The idea of fall-appropriate decor often conjures up images of dark colors and simple patterns. While we’re all for embracing a simpler decor aesthetic every now and then, sometimes, the best thing to brighten up gloomy weather is a bright, playful color palette. Enter Joy Cho’s Oh Joy! fall home collection, featuring her second collaboration with customizable furniture brand Cloth & Company. It’s being sold exclusively at Target—and it’s available now, both in stores and online. The fall collection is broken down into 18 home decor products and 21 furniture pieces, so if you’re looking to infuse fun patterns into your home, consider every aspect of the decorating process sorted. Prices range from as low as $9.99 for decor items to $1,099 for larger furniture—so, there’s sure to be something at every price point. The line includes more demure, classic pieces like an elegant gold pitcher and a chic blush velvet sofa. (See? Millennial pink is alive and well.) And for those interested in something a little bolder, Cho’s signature daring style still takes center stage—graphic-printed armchairs, colorful pom pom throw pillows, and a vibrant-hued velvet throw blanket are just some of the whimsical pieces available in the new line—the latter of which is a personal favorite of Cho’s. As for how to go about styling your fun new finds, Cho is here to help. For starters, she recommends finding a focal point and building around it. 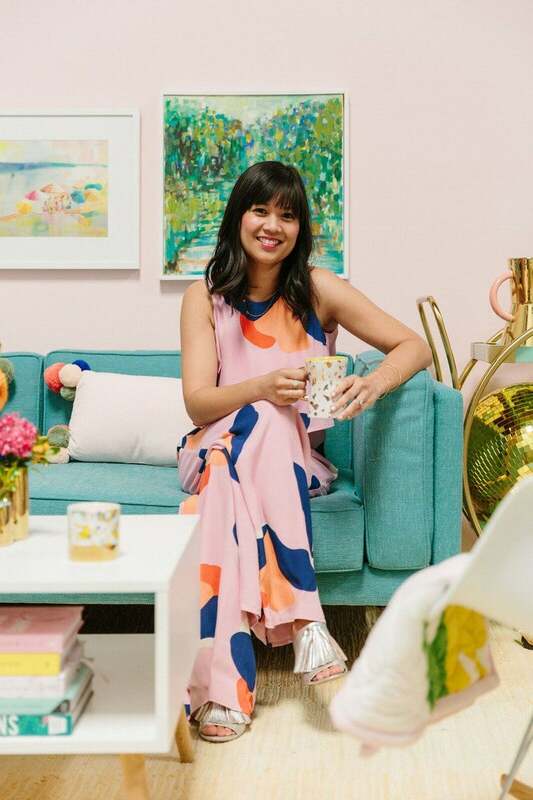 “Whether it’s a bold, patterned piece of furniture or a unique bar cart, make sure every room has a standout piece that provides both interest and a touch of fun,” she says. Next, switch up your statement-making decor by trying bold black and white options. “If you’re not a huge fan of bright colors, you can still make a statement in black and white by adding in modern and bold prints in this very neutral color way,” she continues. Shop the Oh Joy! for Target fall collection online here.